Item Number : 52091Feature : LOVESEATDimensions : 73"Lx45"Dx.. 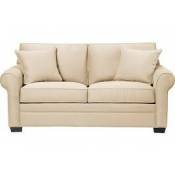 Item Number : 05496Feature : BONDED L/CHENILLE LOVESEATDimensions.. Item Number : 05946Feature : DARK BROWN LEATHER LOVESEATColor :Di.. Comfort is yours for the taking with the Segburg reclining loveseat with ce..
Feel inspired by nights out on the town with the Torcello loveseat. Upholst..
12000 Bladen LoveseatIf you love the cool look of leather but long for the ..
12001 Bladen LoveseatIf you love the cool look of leather but long for the ..
13000 Milari LoveseatMilari loveseat masters the art of smart and sophistic.. Inches: 66” W x 39” D x 39” HColors:CharcoalStyle:Contemporary.. Item Number : 15031Feature : TOP+SPLIT LEATHER LOVESEATDimensions.. Inches: 73” W x 41” D x 40” HColors:WheatStyle:Traditional.. Item Number : 15161Feature : CHENILLE/PU LOVESEAT W/2 PILLDimensi..
Indulge in feel-good luxury and crisp, contemporary style at a price sure t..
What do you get when you mix craftsmanship and style? The Hannalore lovesea..
There’s nothing bland about the Gleason loveseat. Two-tone charcoal color i.. The sleek mid-century lines of the Alenya loveseat are always in vogue. Wit..
Bring home ultimate comfort with the Levelland reclining loveseat. Recline ..
Bring home ultimate comfort with the Levelland rocker recliner. Recline bac.. Inches: 69” W x 37” D x 38” HColors:FogStyle:Traditional..
Dimensions (Confirmed):Inches: 68" W x 40" D x 40" HMetric: 1727.2mm W x 10.. Whether you’re a bit tight on living space or you simply want an excuse to .. Inches: 71” W x 39” D x 38” HColors:GrayStyle:Contemporary..
Dimensions (Confirmed):Inches: 68" W x 44" D x 38" HMetric: 1727.2mm W x 11..
Dimensions (Confirmed):Inches: 73" W x 45" D x 42" HMetric: 1854.2mm W x 11.. Inches: 57” W x 38” D x 37” HColors:FogStyle:Contemporary.. Inches: 66” W x 40” D x 40” HColors:LinenStyle:Casual.. Inches: 71” W x 40” D x 39” HColors:ToffeeStyle:Contemporary.. Inches: 61” W x 41” D x 36” HColors:AshStyle:Casual..
28800 Corley LoveseatThe suitlike upholstery of the Corley loveseat is made.. Inches: 68” W x 41” D x 37” HColors:SmokeStyle:Contemporary..
Dimensions (Confirmed):Inches: 82" W x 41" D x 42" HMetric: 2082.8mm W x 10..
Dimensions (Confirmed):Inches: 78" W x 42" D x 40" HMetric: 1981.2mm W x 10.. Inches: 66” W x 40” D x 41” HColors:CafeStyle:Contemporary.. Dramatically transform your living space with the rustic look of weathered .. Inches: 59” W x 39” D x 36” HColors:PewterStyle:Contemporary..
Dimensions (Confirmed):Inches: 64" W x 41" D x 41" HMetric: 1625.6mm W x 10.. Inches: 65” W x 38” D x 38” HColors:TaupeStyle:Traditional.. Inches: 81” W x 41” D x 41” HColors:BarkStyle:Contemporary..
Rock the cool look of leather minus the hefty price tag with the Boxberg po..